What is the purpose of life on Earth? Philosopher Jacob Needleman frames man's role on the planet in a completely new and fresh way, moving beyond the usual environmental concerns to reveal how the care and maintenance of a world is something vital and basic to our existence as authentic human being. The acclaimed author of books including The American Soul, The Essential Marcus Aurelius, Lost Christianity, and Money and the Meaning of Life, Jacob Needleman is professor of philosophy at San Francisco State University, and former director of the Center for the Study of New Religions at the Graduate Theological Union, Berkeley. He has also served as research associate at the Rockefeller Institute for Medical Research and was a research fellow at Union Theological Seminary. Oakland - Jacob Needleman discusses and signs "An Unknown World"
Diesel, A Bookstore in Oakland welcomes local author Jacob Needleman back to the store to discuss and sign his new book, An Unknown World, on Friday, September 28th at 7pm. In An Unknown World, philosopher Jacob Needleman frames man's role on the planet in a completely new and fresh way, moving beyond the usual environmental concerns to reveal how the care and maintenance of a world is something vital and basic to our existence. In some of his most deeply affecting writing, Needleman draws on his childhood experiences with a terminally ill friend whose impending death forces the young boys to face questions and the meaning of existence at an early age - questions that Needleman carried with him throughout his career as a scholar of religions. The conclusions that he reaches will give all of us a new sense of the purpose of our lives and the planet we live on. 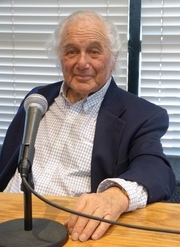 Jacob Needleman is the acclaimed author of The American Soul, The Essential Marcus Aurelius, Lost Christianity, and Money and the Meaning of Life. He is professor of philosophy at SF State University, and former director of the Center for the Study of New Religions at the Graduate Theological Union in Berkeley. He has also served as research associate at the Rockefeller Institute for Medical Research and was a research fellow at Union Theological Seminary. He lives in Oakland. Jacob Needleman is currently considered a "single author." If one or more works are by a distinct, homonymous authors, go ahead and split the author. Jacob Needleman is composed of 3 names. You can examine and separate out names.